Hello 2016! As this first day of the brand new year draws to a close, my thoughts harken back to some of my favorite manatee moments of this year just past, 2015. I assembled this collage of special moments covering early and later months in 2015. Florida’s manatees are indeed world famous! And some of the few remaining natural warm freshwater manatee wintering sites are in Crystal River’s Kings Bay, part of the Crystal River National Wildlife Refuge. This is also one of the few places one can observe these gentle giants underwater. And this I am very thankful for. Days Japan, a very well respected photojournalism magazine, contacted me before Thanksgiving and asked me to write some text to go along with the five photographs they had picked out. I was excited to write an article and captions that would be translated in Japanese. Indeed I think the Japanese lettering goes well with our manatees’ personalities! What do you think? Days Japan Magazine 1st Page of my Manatee Article (pg. 56) with Lovely Japanese Characters! About two weeks ago I was putting myself through some paces with a bit of preseason in-water camera practice, when low-and-behold a young female manatee appeared! Three Sisters Springs, Crystal River, is a gem amongst Florida’s lovely natural springs. If you have followed the news lately surrounding the springs, some more restrictions reducing the number of in-water visitors are going to be implemented. Although remember, the nice boardwalk will continue to be open for above water viewing. I just pray the natural, magical beauty that is the essence of Florida’s jeweled freshwater springs, remains intact. Luckily, manatees can still be viewed from kayaks and in-water at a number of other spring sites around King’s Bay, including just out front of Three Sisters Springs. Reminiscing on all the magical times I and my friends have had at Three Sisters Springs, this memory of my friend Meredith and her dog Benson, is one of the happiest and most poignant. 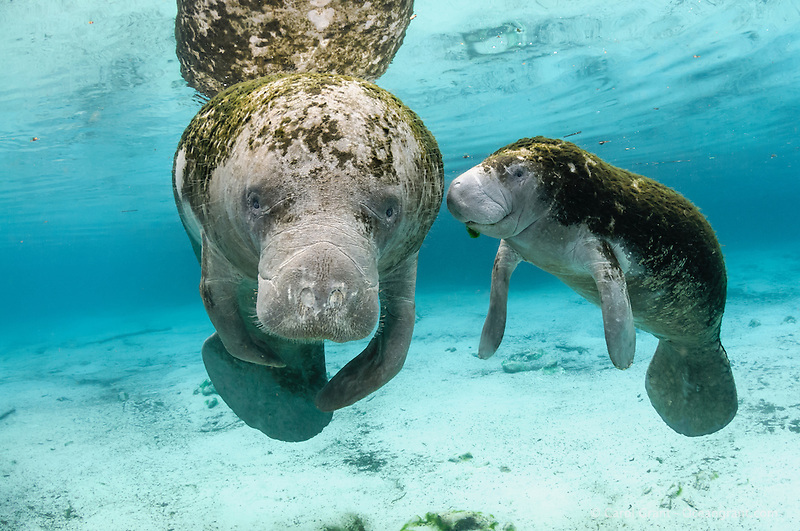 Manatees – they are charismatic, enthralling, and undeniably cute marine mammals! Added to this, the beauty of their warm winter springs home is unparalleled. All this equals the possibility of stunning underwater prints to enjoy!